The Advanced Multi-function Weight Indicator Avery Weigh-Tronix ZM303 is a high performance indicator suitable for industrial applications. This multi-function indicator includes a full numeric keypad. The ZM303 offers multi-connectivity, with Ethernet, RS232 and a USB Host port as standard and Analog output, USB device, Current Loop, RS485/RS422 and Wireless options available. The numeric keypad allows ZM303 users to store multiple Tares and numeric IDs in the internal memory for easy retrieval. Keys for counting, checkweighing and process control operations are also standard. The ZM303 indicator is available with two highly visible display options. The high contrast, nine segment IBN display technology provides excellent color contrast and enhanced viewing angles. The TN LCD display technology features dark digits against a lighter background and a green backlight that is easy on the eye. A robust IP69K certified stainless steel enclosure for harsh indoor or outdoor use, or a stainless steel panel mount design for control room applications. We have a group of professional highly qualified with long trajectory to its full available, as organization open them doors a countless of opportunities. with regard any choice the product that you requires, based us its need. We offer immediate advice in relation to choice any product related at market of weigh-in. Contact us through our email addresses or directly in our telephone lines requesting advice and quotes for interchangeable products completely free. Would you like precision? Tired of highly expensive products? Need quality? A durable, stable product? You’re in the right place! Here you will find the best load cell, all models all brands, are highly efficient and long-lasting products because we reserve the best materials just for you. 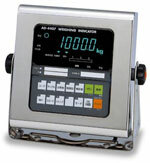 All our Advanced Multi-function Weight Indicator Avery Weigh-Tronix ZM303 are guaranteed. We are obsessed with quality! Load cells you will find here have been previously tested in our laboratories, innovative and reliable cells. Advanced Multi-function Weight Indicator Avery Weigh-Tronix ZM303 are one of the best on the market this days. What are you waiting for ?